Growing up, making strawberry shortcake was a tradition. The only thing that might seem strange to some is that my family ate it for dinner–as the main course! We did this in the fall with apple dumplings, too. When I got married, however, I realized when I made strawberry shortcake the first time, that not every family shared this dessert-for-dinner tradition. My husband actually thought I was kidding and looked in the oven where he was sure he’d find the real dinner hiding! This is my mom’s classic recipe. It is easy but completely delicious. Not too sweet, it allows the strawberries to shine. Sprinkle a little sugar on top for added sweetness. We like to serve the warm shortcake in a bowl with heated milk poured overtop. Whipped cream may be preferred if you are eating this for dessert; I also like vanilla Greek yogurt. For an excellent gluten free alternative, you might want to try Gluten-Free Almond-Coconut Shortcakes. 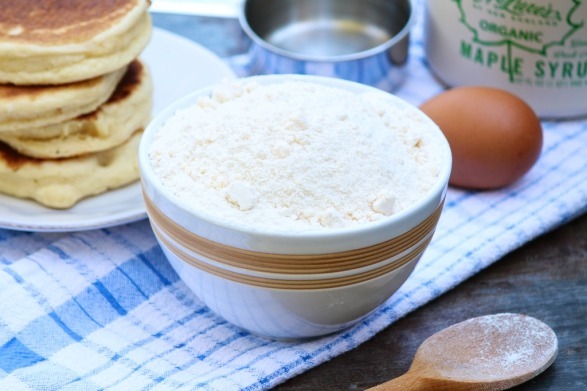 Mix all ingredients, adding milk a tablespoon at a time until the batter comes together. Mix until just combined. Drop by large spoonfuls on a cookie sheet, or spread the batter into a 9×9 pan. Bake for 10-12 minutes or until golden brown. Individual shortcakes will take a minute or two less. Serve warm with strawberries and milk, yogurt, or whipped cream. 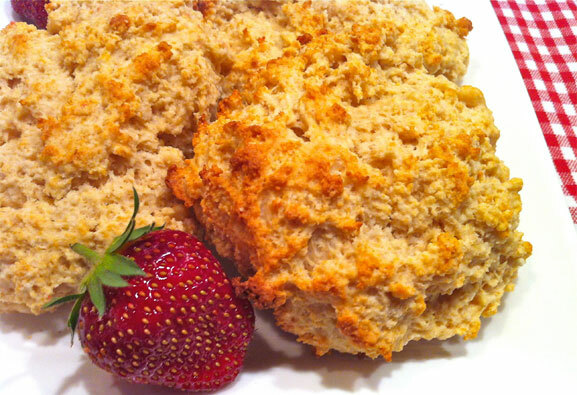 You may enjoy making the shortcake with a homemade version of Bisquick. The minute I saw the picture, it brought back memories. This was sunday night”supper” on a warm night at it’s best. This is one of those “in my head” recipes that my daughter needs to learn form doing.Thank you for the memories., and something in writing she can follow. Thank you for the great comment! 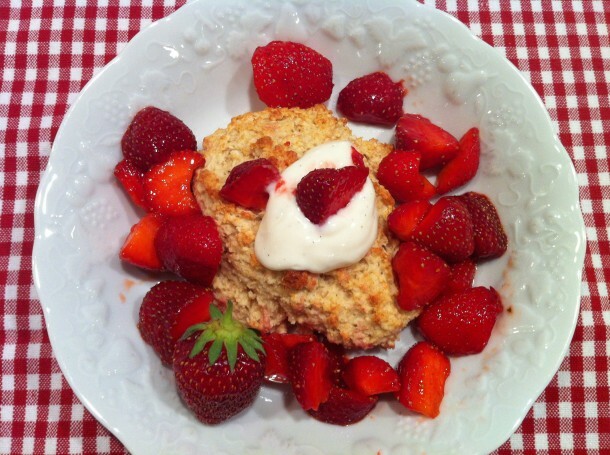 Meals with memories are extra special, and strawberry shortcake has so many memories attached for me, too! Strawberry shortcake is one of my favorite summer desserts. I love the twist on the shortcake and almond and coconut are an amazing combo. Love it! Love the simplicity ofyour recipe but you (and others) do not indicate how many your recipe serves. Hi Alison, Most of my recipes include a yield, although this older post does not. I do mention the option of using a 9-inch square pan, so you can easily visualize the number of servings based on the size piece desired. In this case, I’d say you can get nine good-size squares.